Billy Lynn's Long Halftime Walk – 4K Ultra HD Blu-ray review | What Hi-Fi? Ang Lee's most recent film heralds a possible future of cinema, but is it a future worth seeing? Ang Lee tells small stories on huge canvases, blending old-fashioned storytelling with new technologies. It worked for Life of Pi and it’s a tactic he returns to for Billy Lynn’s Long Halftime Walk, his adaptation of Ben Fountain’s novel of the same name. Shot in 4K, 3D and 120fps, the question is: can it repeat Pi’s success? The film sees 19-year-old Billy Lynn (Joe Alwyn) return home with his Bravo squad for a tour that takes in a halftime show at an American football match. Through flashbacks we learn the truth of what happened to Billy and his squad in Iraq, and his struggles to come to terms with what happened there contrast with the sense of Americana he returns to. Billy Lynn, like much of Ang Lee’s other work, is quite slow and intimate, meditating on the lives of characters within seismic, life-changing events. It’s a film with plenty on its mind - it dwells on trauma, masculinity, propaganda, spirituality and brotherhood, all threads and themes modern war films tend not to fixate on so much. At least not in this fashion. However, Billy Lynn struggles to develop an entirely engaging narrative. It’s a ponderous film that focuses on Billy’s interior life but could use a little more heat in terms of its drama. Unless, that is, you count the spectacular halftime show or the Iraq war battle, which are engaging sequences. Like Pi it’s a film that washes over you, requiring faith in Lee’s storytelling - some may feel that patience their exhausted by Lee’s languid approach. We're fans of his approach, though this is Lee in minor- rather than major key. The cast includes the likes of Chris Tucker and Steve Martin and, apart from a few cringeworthy moments, performances are mostly decent. Newcomer Alwyn puts in a decent shift and a convincing Texan accent; Vin Diesel’s turn as Bravo team’s commander is suprising; Kristen Stewart is a spiky presence as Billy’s sister Kathryn. This is an intimate piece of work that’s content to be a low-key affair rather than etch itself into your memory. Billy Lynn’s Long Halftime Walk was shot in 3D, 4K and 120fps. However, the UHD format does not support 3D and 120fps has become 60fps. The film starts with a fuzzy, low-res image that apes war footage, and soon coalesces into something that’s crystal-clear. Both foreground and background are perceptible, making for a hyper-real look that produces a sense of depth and perspective not unlike what you'd encounter in everyday life. Scenes are often static and characters look straight into the camera lens, allowing facial detail to come to the fore. Skin-tones are flushed (naturally so, we’d argue), with skin colouration, spots and other blemishes noticeable on actors’ bodies. Some may find it unflattering, but it adds to the realism and intimacy Lee strives for. Shadow detail is impressive, producing a sense of shape and depth to actor’s faces without losing detail. Lighting is better resolved here than on the 1080p Blu-ray - a look at the luminescence produced by the blue light in a Stretch Hummer adds a sense of dimensionality and depth. Colours are strong and firm, and can be quite vivid in the show-stopping halftime show. Scenes in Iraq are bright, but never to the point where they become hot. As it was shot in 3D, a few scenes look cookie-cutter flat, as if the actors were cardboard cutouts. It makes you aware of the film’s artifice, and hurts the film’s attempts at realism. There’s some clipping of character’s bodies too, and, while we feel the frame-rate avoids making the performers look waxy, it takes a while to get use to. Some will like it, others won’t - though it lacks that cinematic feel, it can produce fantastic results. We love the clarity and detail on offer in this transfer, but the image does feel compromised in some areas. 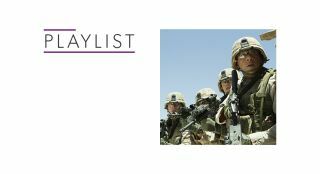 Billy Lynn's Dolby Atmos track won't be shaking the room like your average blockbuster, but it does produce an excellent sense of immersion. Dialogue is centred and delivered with clarity, and background chatter is audible. A scene early on during Dime's (Garret Hedlund) address to his troops has Chris Tucker yammering on the phone, creating depth and adding to the film's realism. The soundtrack is excellent at replicating the sensation of being in an environment, capturing the many different reverberations with great accuracy and specificity during a scene in the bowels of the stadium. Then we get to the halftime show, which shows off the track's ability to go big - bass is thrumming, and Destiny's Child (or their stand-ins) generate the sensation of a high-energy concert show. The Iraq battle scene is excellently done too, full of detail and excellent positioning of effects. Bullets fizz past, buildings are rocked by RPG blasts and the clank of spent shells from rifles makes for an intense few minutes. if we haven't emphasised it enough, this track is all about achieving a sense of realism. When it goes loud it can be riveting, but perhaps even more enjoyable is the way is puts you in the middle of the action. Billy Lynn's Atmos track is an excellent way to experience the film. The film is hit-and-miss, a slow, restrained take on the toils of war and PTSD that deserves credit for tackling such a subject. There are moments, though, where Ang Lee misses the mark, going for a tone or emotion that seems awkward and unconvincing. The 4K Blu-ray is impressive in terms of colour, clarity and detail. Some may find the 60fps off-putting, and there are a number artefacts left from the 3D down-conversion that are less than ideal on a flatscreen panel. The soundtrack engineering is great, presenting a sense of place specificity that aids the film's attempts at realism. We'd say Billy Lynn's Long Halftime Walk is worth a look, especially if you want to know what the future of cinema might potentially look like. Inside you'll find a code for a digital copy of the movie and an insert for Sony's collection of UHDs, which serves to remind us that The Smurfs is available in 4K. Ang Lee's talk on the film's frame-rate is on the UHD disc, and is in 4K. The rest of the special features are in HD.